The eNotes Blog: The Algonquin…Marriott?? This week it was announced that the infamous Algonquin Hotel has been purchased by the Marriott hotel chain. 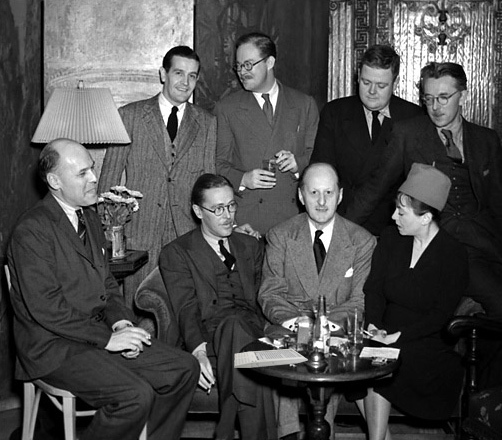 In June of 1919, a group of writers, critics, journalists, and actors—among them, Dorothy Parker, Robert Benchley, Edna Ferber, Alexander Woollcott, and Harpo Marx—began meeting for lunch at the Algonquin Hotel. The hotel was a short distance from the offices of The New Yorker where many of the members worked. Jokingly, the members coined themselves “The Vicious Circle,” as they delighted in gossiping about and criticizing fellow artists. They did indeed meet at a round table for their banter and cooperated on projects there together. The group members contributed to hit plays (No Sirree! by Robert Benchley), wrote best-selling books, and popular newspaper articles. There were those who did not support the group. A number of writers found the Vicious Circle far too mean-spirited. The noted critic H. L. Mencken once commented to writer Anita Loos that “their ideals were those of a vaudeville actor, one who is extremely ‘in the know’ and inordinately trashy.” Groucho Marx was not a fan either. “The price of admission is a serpent’s tongue and a half-concealed stiletto,” he said. Despite its detractors, the gatherings lasted for nearly ten years. However, by 1929, the members had largely disbanded. Edna Ferber realized it was truly over when she arrived one day in 1932 and found a family from Kansas lunching at their table. The group split up, but its fame remained. As for the Algonquin, the management remained committed to supporting writers. Alan Jay Lerner and Frederick Loewe composed My Fair Lady while staying at the Algonquin, even though it is said that some guests complained about the noise. Will the Algonquin Marriott maintain its committment to supporting the arts? It remains to be seen. There is a sign that perhaps they will continue the tradition, however. All guests at the hotel are offered an Amazon Kindle, preloaded with the book of their choice.